So, Every so often I have really bad days. Really sad days. Days when I really want to write about what's going on, but I don't/can't. It's hard to vent about those days without giving the background/history to where a lot of it stems from. But I never really know how to write up that history. Well yesterday my 20yr old nephew sent out a note to all of us on FB asking for inspirational stories. This coming from a young man just back from a year in the Army stationed in Iraq. While out being CraftyME picking up yarn and getting a much needed breather, I noticed that I had been tagged in a response to this request. MyOtherHalf (MOH), Jamal wrote this, and I decided to share it here as it says much of what I've been wanting to say. *Disclaimer* (tm Sunny) it's kinda long and kinda emotional. but then again so is our life. 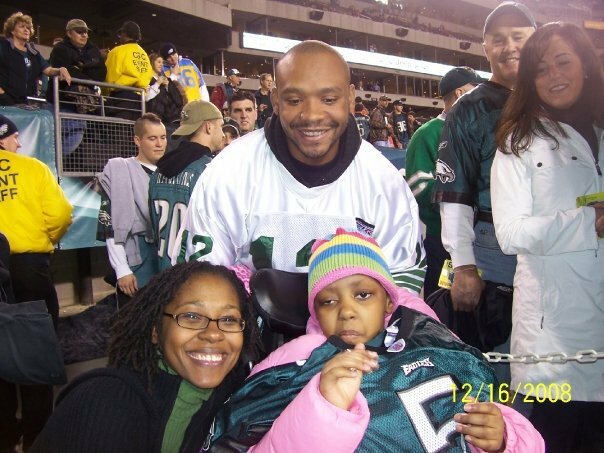 As you are well aware of, I have a daughter that is disabled due to complications from a surgery that was needed to save her life. She has been battling brain tumors since she was fourteen months old. Back in September 2006, she had a surgery that was meant to relieve pressure put on her brainstem by the tumor. Because of where her tumor is located, and the nature of what her tumor is, the surgery was beyond risky and wasn't meant to save her life as much as was to prolong it. She survived the surgery. That was a blessing in and of itself. The doctors couldn't promise anything; not even that she would make it off the table. She didn't fully awaken after surgery, but after all she had been through, the doctors figured she would sleep for a few days in order to recuperate. The Sunday after surgery, however, something went wrong. Her stats were all over the place. One minute she was about to have a stroke and the next her heart rate would be so low that the doctors felt she would just fade away. At some point Monday afternoon her stats leveled out, somewhat, and she fell into a comatose state. Every doctor who had examined her said she would die there. Six months passed. Hospice doctors had suggested that we take her off of feeds in order to speed the process of death. It was a very difficult time for Dorian and me. Who wants to make those types of decisions about their child? Then something changed. Mikayla has had cats that have basically grown up with her. They are, in essence, her siblings. When she first came home on hospice they would lay in her room almost mourning her. They would lie under her bed, on the dresser, on the chair, but never in her bed as they would when she was awake. We entered her room one morning to turn her, change her, and fill her feed bag and noticed that Lady, one of the cats, was laying on the bed beside Mikayla. Mikayla's hand rested on Lady's body as if she was trying to pet her. We thought ourselves to be crazy. It couldn't be. We called her doctor. She came out to the house to look Mikayla over. She decided to bring her in to the hospital to run some tests. We took her in to the hospital and a few days later, she awoke! Since then, life has been very difficult and complicated. Mikayla has numerous disabilities that make it even more difficult to care for her. Caring for her is a full time job but it doesn't pay the bills. In order to do that, we both must maintain fulltime employment. We get very little help from Social Security. What they provide us with financially per month barely covers the cost of her pull ups if that. I have heard stories of children with ADD diagnosis who get more help. It could be that we are asking the wrong people. I am not sure. I do know that we could use the help. My daughter is now ten years old. She will be eleven in August of this year. She has been surviving; continuing to battle in a war that the doctors still say she has no chance in winning. One day she will be consumed by her illness. We continue to hope that something will change. Even if it doesn't, I count myself as blessed to have known a child as resilient as Mikayla. It hasn't been easy, but she has taught me that nothing is impossible. She has overcome obstacle after obstacle in her life and continues to amaze doctors and people everywhere. We push on through this life with the hope that one day we will be able to get the help we need. We push through the unknown everyday in hopes that our child will one day be able to live the type of life she had before she got too sick. We push because that is all we know how to do. It is my daughter’s legacy. Share this story with as many people as you see fit. Hopefully it will encourage someone. Hopefully it will inspire others." I've never heard him my uncle say anything more serious than "Stop yelling, I'm trying to hear the game." Or "who drank the last lil' bit of Moscado?" But, I asked for inspirational stories and this is what he gave me... Wow... Just goes to show that no matter how u complain about the situation ur in, u've got people who have a tougher hand than u and are dealing with it... I love my fam and its company... This is why! Dorian and Jamal, you are both truly amazing people and parents. You are so strong, and I can't imagine how difficult some days must be for you, and for Mikayla. She is so lucky to have you both. You are always in my thoughts, and if you ever need anything, please don't hesitate to contact me, even if you just need someone to come over so you guys can do stuff around the house without worrying. Dorian, I know we've only met twice, but I hope I get to see you again soon at Whole Foods knitting group! !